See “Usage” section on the Description page to learn more. What are the “Exclude from Sync” and “Delete Missing” features? New in v3.2.0, you can enable the “Delete Missing” feature when running either an Untappd or Untappd for Business (UTFB) sync. For an Untappd sync, this means that if any beers associated with an Untappd ID are no longer found on Untappd, they will be moved to the trash. You can permanently delete these beers from the WordPress trash interface. For a UTFB sync, this means that if any menus associated with an UTFB ID are no longer found on your UTFB account, they will be PERMANENTLY deleted. This will not affect any of the beers that are associated with the menu. If you do not want the sync feature to make any changes to or delete a specific beer or menu, enable the “Exclude from Sync” checkbox, located on both the menu and beer edit pages. Can I use content filters with EM Beer Manager? Why is an Untappd account required in addition to an UTFB account? Untappd for Business (UTFB) account credentials do not work with Untappd’s API. In order to link Untappd data to beers imported from UTFB, Untappd API access is also needed. An Untappd brewery account is not required to work with UTFB. A standard user account will work. Where do I find my Untappd for Business API key? You can find your API key under the “API Access Tokens” section of your account. Why am I seeing a “rate-limit” error? "All API applications are rate-limited to protect against abuse and keep the platform healthy. The default limit for API access is 100 calls per hour per key." If you see this message, it means your authenticated API session has reached this limit and any actions that require an API call will be limited until your access is reset in the next hour. In most cases you should still be able to use all of the Untappd features with cached data, but rare cases may display a rate-limit warning message when no cached data is available. What is the ‘Labs’ section and how risky is it to use? New in v2.1.0 is the EM Beer Manager ‘Labs’. This is a section where we plan to introduce new and experimental features for users to test. We do test all of the lab features before making them available, but cannot guarantee that there won’t be any issues or bugs when using them, since they are still being worked on. If you experience any issues while using a Labs feature, please contact [email protected]. How do I access EM Beer Manager beers, styles, and groups in the WordPress API? Starting with v2.1.0 you can now access and update EM Beer Manager beers, styles, and groups from the WordPress API. Beers can be accessed using /wp-json/wp/v2/embm_beers or individually at /wp-json/wp/v2/embm_beers/<beer_id>. Styles can be accessed using /wp-json/wp/v2/embm_styles or individually at /wp-json/wp/v2/embm_styles/<style_id>. Groups can be accessed using /wp-json/wp/v2/embm_groups or individually at /wp-json/wp/v2/embm_groups/<group_id>. Menus can be accessed using /wp-json/wp/v2/embm_menus or individually at /wp-json/wp/v2/embm_menus/<menu_id>. Additionally, beer profile, extras, and Untappd information is available via the API and is able to be updated via POST/PUT calls. I accidentally deleted some of the pre-loaded styles, how do I get them back? Starting with v2.0.0, users are now able to easily restore any missing styles. Go to the EM Beer Manager settings page. Under the “Settings” tab, click on the “Restore Styles” button. This will restore any missing styles from the pre-populated Untappd list. It will not affect any already existing or any custom styles. EM Beer Manager updated the beer database structure in v1.7.0 and should automatically make any necessary changes. However in the case that the automatic update does not work, you will need to uninstall EM Beer Manager and install the latest v1.7.x or higher release to maintain functionality. You will not lose any of your Beer or Styles data when uninstalling the older version. How do I display an image of my beer next to its name and description? When creating your new beer entry, set the “featured image” option in the sidebar to the beer image you wish to use, it will display alongside the entry when the beer is displayed on your site. How do I display a single beer on a page? Use the [beer id=#] shortcode inside the WordPress page editor to add a beer to any page. Replace the “#” with the ID of the beer you wish to display, which is listed on the “Beers” admin page. How do I display a list of all my beers? Use the [beer-list] shortcode inside the WordPress page editor to add a list of all your beers to any page. I don’t want to show that big grey box of information, how do I get rid of it? For both the [beer id=#] and [beer-list] shortcodes there are 2 optional attributes of show_profile and show_extras. Set both of these to false to hide the grey box. What’s the difference between `show_profile` and `show_extras`? The show_profile setting refers to all the content in the “Beer Profile” information stored for each beer. This includes ABV, IBU, Hops, Malts, Additions, and Yeast. The show_extras setting refers to the “Extra Beer Information” content stored for each beer. This includes Beer Number, Availability, and Additional Notes. Why isn’t the Untappd check-in button hidden when I set `show_extras` to false? The Untappd check-in integration is handled separately from the show_extras setting. To hide the button for a single beer, make sure the “Untappd Check-in URL” box is empty – a square Untappd check-in icon will appear on the “Beers” admin page next to the beers where the button is active. You can also completely disable the Untappd options through the “EM Beer Manager” settings page. Try refreshing your permalinks by going to “Settings” -> “Permalinks” and clicking the “Save Settings” button. If you are running EM Beer Manager 1.7.1 or earlier, it may be due to your site’s theme overriding the EM Beer Manager templates. We recommend updating to version 1.8.0 or higher, but you can also edit the templates in the plugin file to suit your needs. 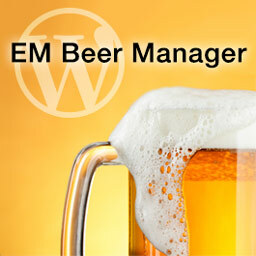 They’re located in wp-content -> plugins -> em-beer-manager -> templates.